Plugging & Abandonment - Plants & Goodwin Inc.
P&G offers a wide range of capabilities to serve a diverse set of plug and abandonment (P&A) requirements in the region. Exploration companies and state governments alike are suffering the same ailment: how to plug wells quickly, safely, and inexpensively. The expertise and tools required for P&A of conventional wells are drastically different from those required for first generation shale gas wells that now require decommissioning. The contractor market remains fragmented and likewise unable to meet demand in a cost-effective manner. Most significantly, pressure to plug more wells for less money has created a culture of shortcuts and unsafe work practices. This is why P&G is the contractor of choice for dozens of clients undertaking P&A projects. P&G’s solution to many of the problems facing clients lies in its turn-key model of P&A project management. Hidden costs are eliminated by setting a not-to-exceed ceiling. The project is managed more efficiently as subcontractor use is minimized or eliminated. Start-to-finish project oversight allows information to be freely shared from one responsible party to the next. 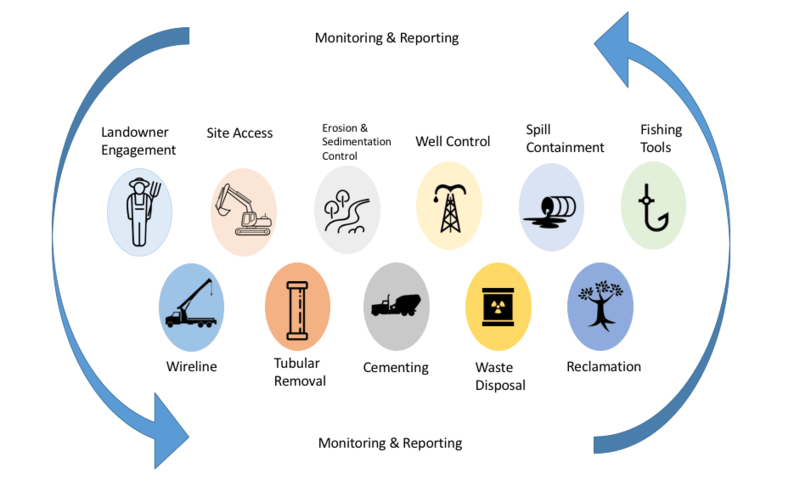 By combining all this with a culture of safety and environmental stewardship, we solve the most difficult problems facing clients in the Northeast today.